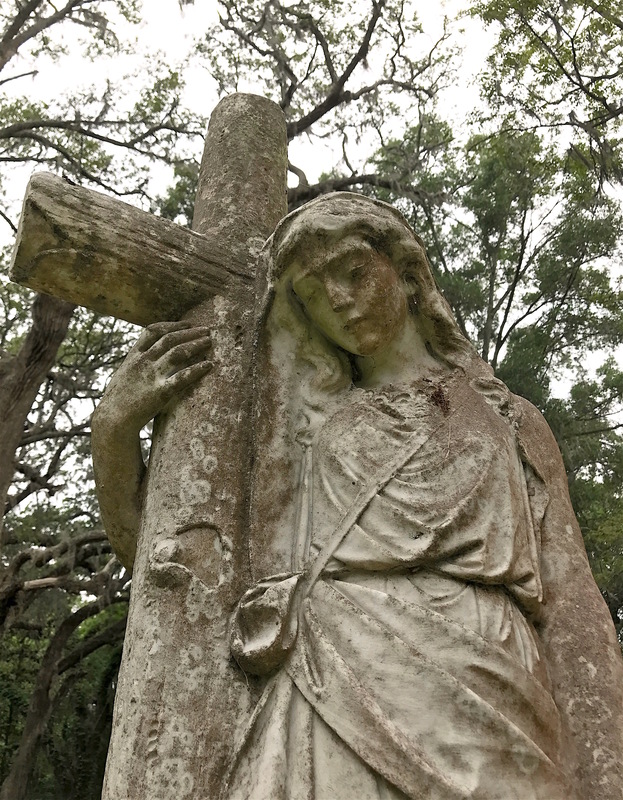 This week, we’re at Trinity Episcopal Church’s (TEC) cemetery, which is only about 1.5 miles down the road from the Presbyterian Church on Edisto graveyard. TEC’s congregation was established in 1774. Like PCE, white members sat on the first floor while black members were confined to sitting upstairs in the balcony. During the Civil War, as was the case for the PCE, white residents were evacuated from the island while slaves remained during the occupation. 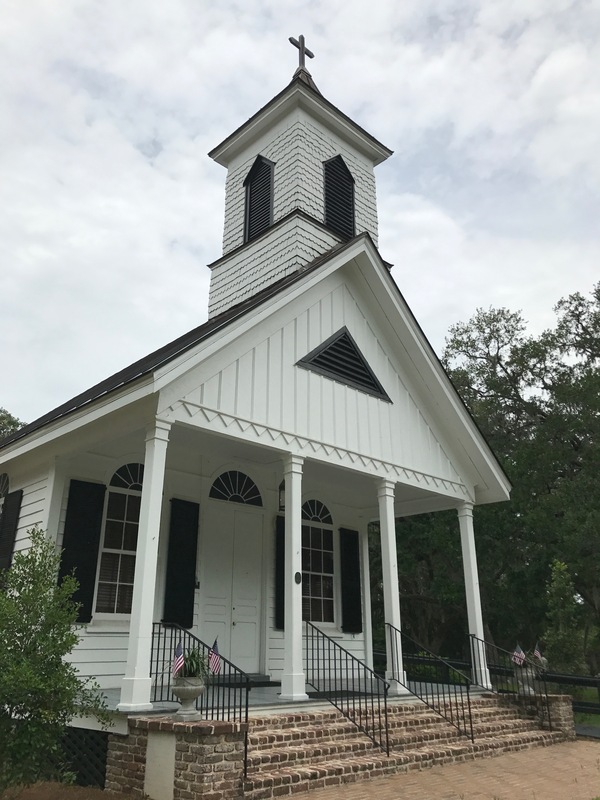 The church building was used by Union forces as an observation post. By 1870, records showed 30 white members and 112 black members. 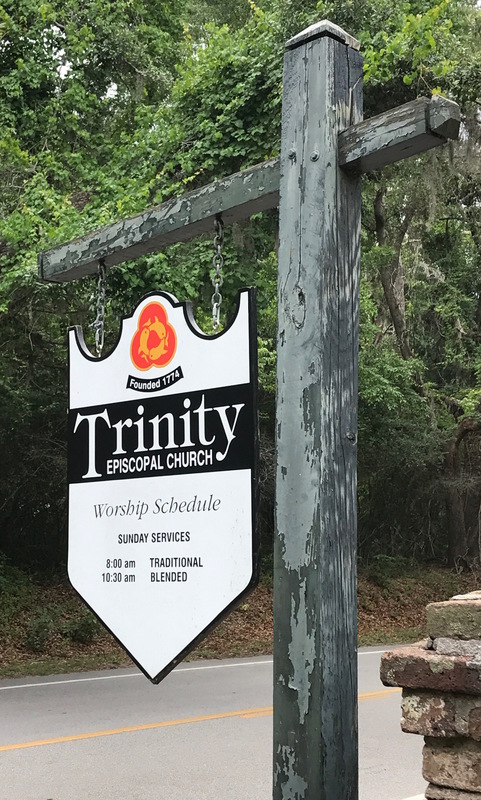 Trinity Episcopal Church on Edisto Island still has services and an active congregation. After the war, black members of TEC formed their own Episcopal church where they were free to sit and worship where they pleased. Around 1890, those members established Zion Reformed Episcopal Church, which still exists today. The current TEC building was completed in 1881. TEC’s building burned around 1876 and a new one was completed in 1881. 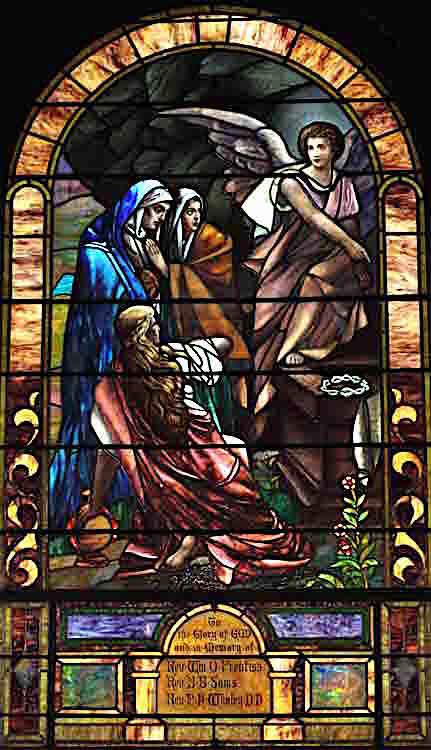 The church was not open when I visited the cemetery, but their web site has a picture of this stained glass window inside. The church was added to the National Register of Historic Places in 1971. TEC is thought to be the only example of a church built in the Victorian style on the island. 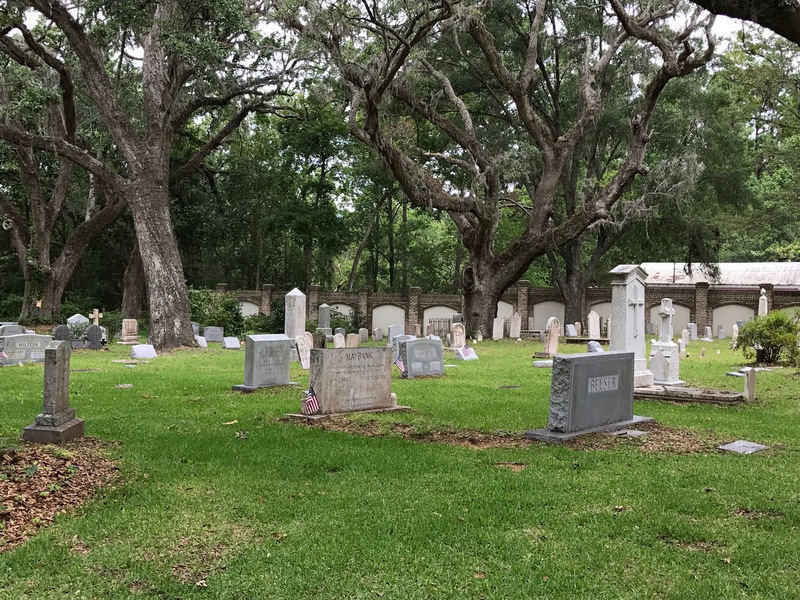 As for the cemetery, nobody knows when burials began there, but it was probably before the congregation was formally organized. Death dates start in the latter end of the 1700s. You can find many of the same surnames at TEC that are present at nearby PCE. 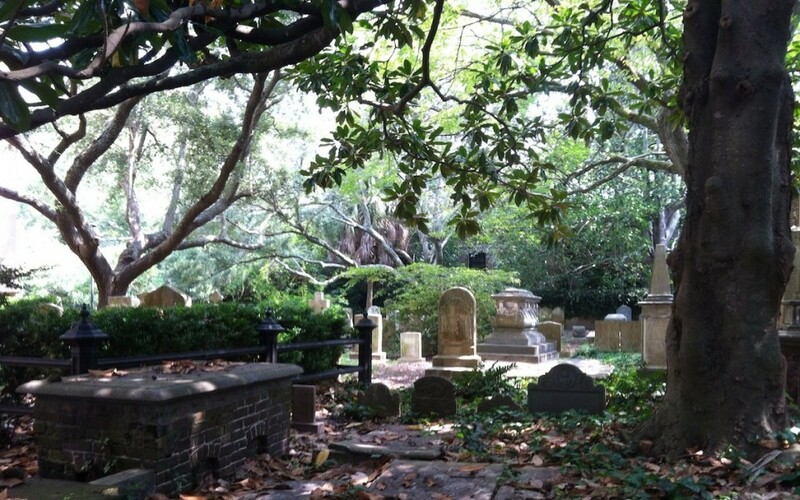 Trinity Episcopal Church’s cemetery has about 315 burials recorded on Find a Grave. I suspect that are many more unmarked. The first marker I saw was directly in front of the church building. 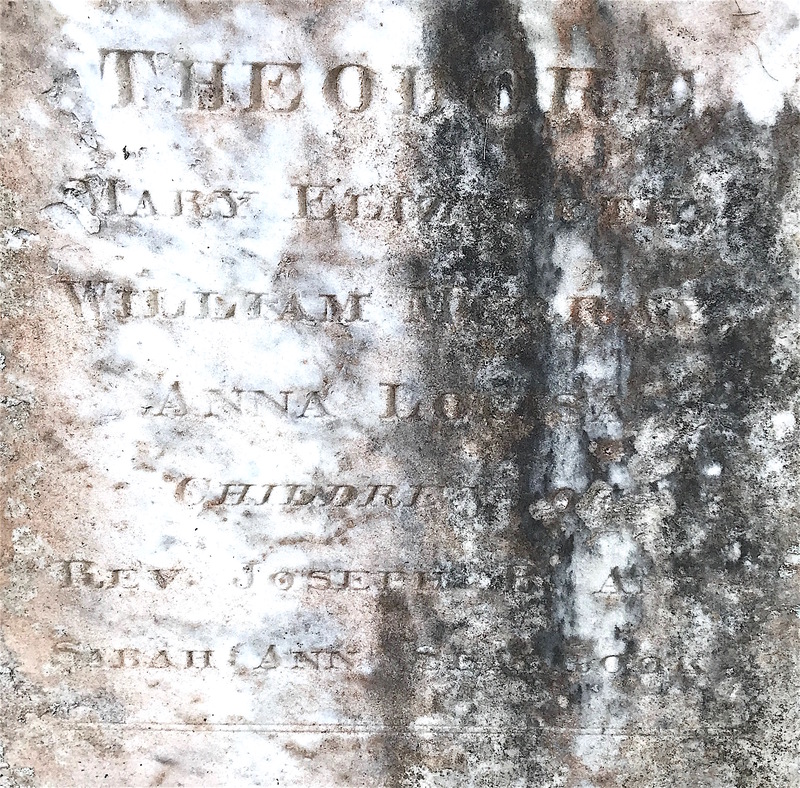 It was hard to read so I’m grateful that some kind soul on Find a Grave had already transcribed it. 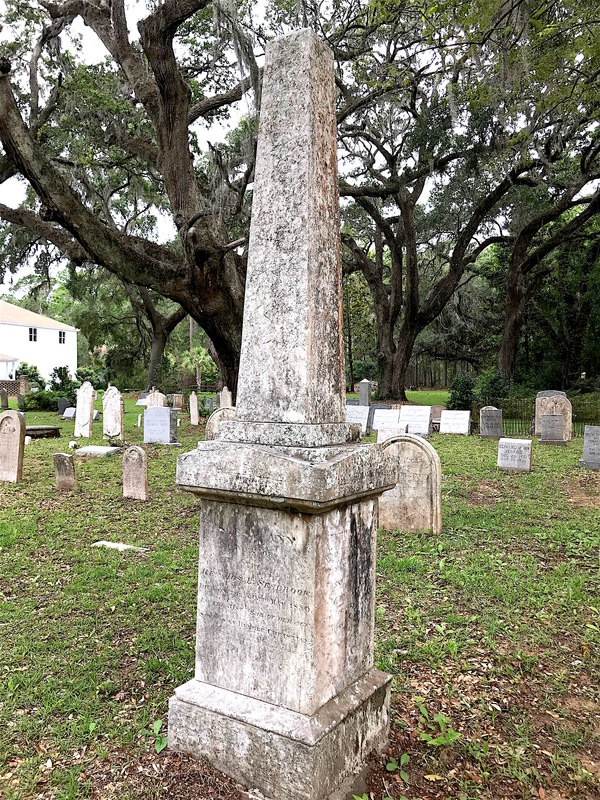 The marker is for Rippon Sams Hamilton Hanahan, who died at the age of 11 in September 1801. 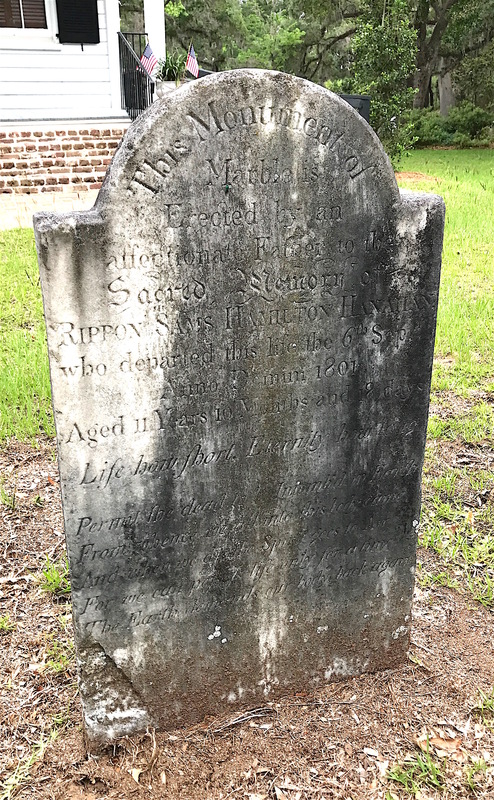 Rippon Sams Hamilton Hanahan’s grave marker is right in front of the church building. Life how short, eternity how long. Permit the dead to be entomb’d in Earth from whence we all into this body came. And when we die the Spirit goes to Air. For we can possess life only for a time. The Earth demands our body back again. Over in the cemetery, I found a monument to Sarah Ann Bailey Seabrook. She died in 1850 at the age of 31. I discovered she was the first wife of the Rev. Joseph Baynard Seabrook, Jr.
Sarah Bailey Seabrook was the first of the Rev. Joseph Seabrook’s three wives. He married her younger sister after she died. A graduate of Princeton, the Rev. Seabrook studied law before turning to the ministry. He was ordained in the Protestant Episcopal Church and pastored black churches at Bluffton and St. Paul. During the Civil War, he pastored at Grace Episcopal Church in Charleston. After the war, he was the pastor of St. Marks in Charleston until his death in 1877. He is not the first pastor I have researched that had three wives over his lifetime. In this case, only two of them were sisters. Before I get ahead of myself, let’s go back to Sarah Ann Bailey, his first wife. I discovered that she and Joseph had four children that lived to adulthood — Martha, Ephraim, Caroline, and Perroneau. But what her monument reveals are four other children that probably did not live past infancy. I don’t know the birth/death dates for any of them. And it’s possible they’re not even buried at TEC. But clearly Theodore, Mary, William and Anna were remembered by their father. Four of Sarah Ann and Joseph’s children did not live past childhood. Soon after Sarah Ann died, Joseph married her widowed younger sister, Lydia Bailey Whaley. They had at least one child together, Isabel, who married John Gervais. Lydia died in 1858 and her burial site is unknown. Joseph married a third time to Martha Beckett, who outlived him and died in 1922. Joseph, who died in 1877, is buried with Martha at Magnolia Cemetery in Charleston. One of the more eye-catching markers I saw was for William Stuart Hanckel, son of the Rev. William Henry and Elizabeth Clark Hanckel. 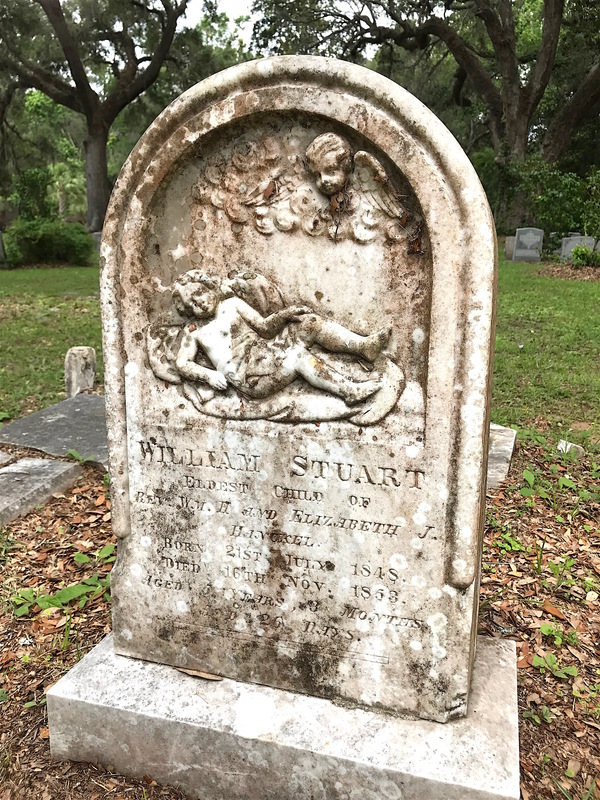 William Stuart was also the grandson of the Rev. Christian Hanckel, who served as the rector of St. Paul’s Church in Randcliffboro, S.C. for 45 years. The Rev. William Henry Hanckel was rector of Trinity Episcopal Church when his son William Stuart died in 1853. A graduate of General Theological Seminary in New York, the Rev. William Hanckel was as distinguished a clergyman as his father, pastoring a number of churches over his career. His brother, James, taught at Diocesan Theological Seminary in Camden, S.C, while brother Thomas was an attorney. The Journal of the Greater Convention of the Protestant Theological Convention notes that William was rector of the TEC in 1853, the same year that little William died at the age of 5. According to the marker, William Stuart was the first child born to the Rev. William Henry and Elizabeth. They would have at least four more. But William is the only one buried at TEC. 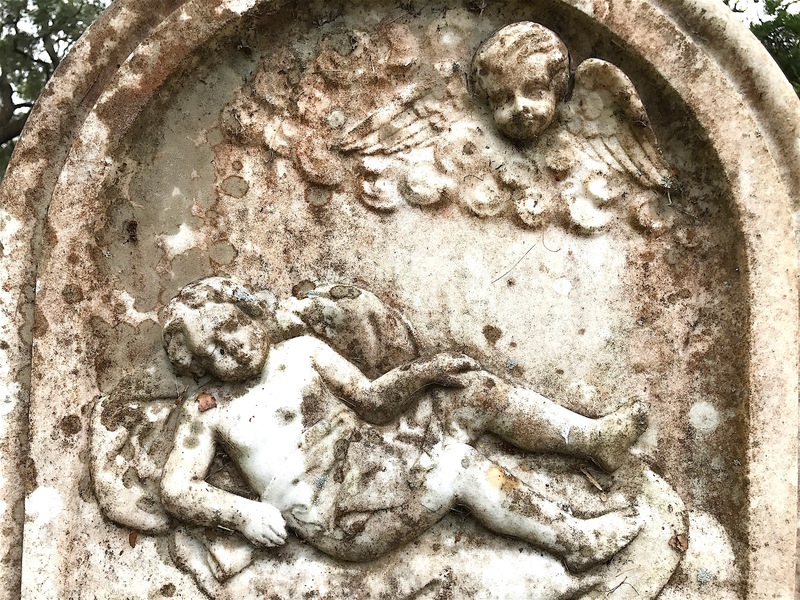 The image of a cherub hovering over a sleeping child dominates William Stuart’s marker. It’s not one I have often seen, although the motif of an angel bearing a child away is quite common. By looking at older photos of this grave, I saw that vandals had damaged it at some point. A 2010 Find a Grave photo shows it attached to a slab with some sort of inscription on it, along with a large lamb statue at the foot. That had changed by 2017 when I was there. The slab is now in pieces and the lamb is in a different position. There was also a box grave beside William’s grave that now appears to be gone entirely. 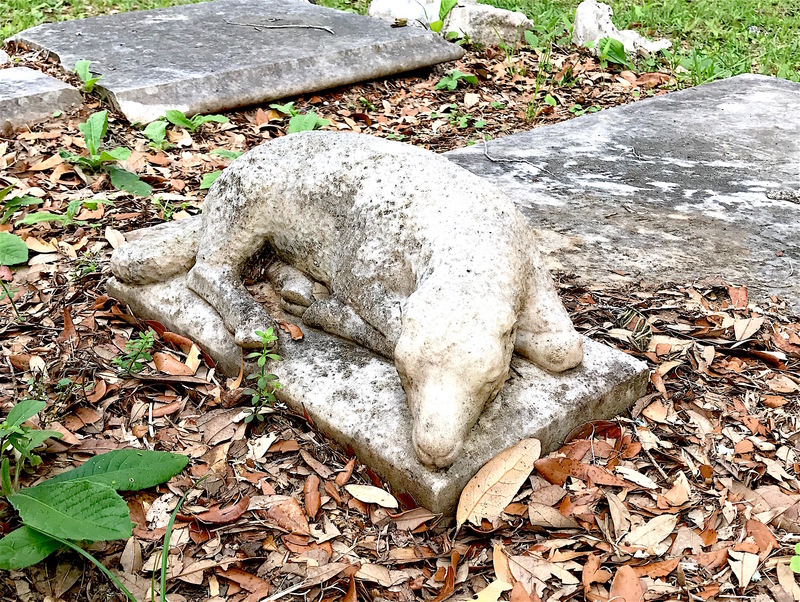 This lamb used to be part of an intact slab upon which William Stuart Hanckel’s gravestone stood. Elizabeth Hanckel died in 1875 at the age of 45 and was buried in Magnolia Cemetery in Charleston. The Rev. William Henry Hanckel remarried to Mary Lieze Macbeth Ogier in 1877. His last church position appears to have been St. Stephen’s Church in Charleston around the same time. By 1880, he and Mary were living at Flat Rock Farm in Pendleton, S.C. I don’t know if he had retired from the ministry. He died in 1892 and is buried at Magnolia Cemetery. Mary, who died in 1911, is also buried at Magnolia but her grave appears to be unmarked. Next week, I’ll have more stories from Trinity Episcopal Church.